Call us at (855)745-1788 to receive Free Shipping on all products. Create Exciting Action in a Bottle! Help children and adults learn about the forces of nature and how air pressure and density work together. People of all ages are captivated by this example of nature’s most ferocious and unpredictable phenomenon. Now they can command the power of the Tornado. Choosing Tornado Tube is the best bet for your display at every register. Give them a whirl…but have a storm shelter ready! Use your colorful Tornado Tube to connect to plastic soda bottles together, and in seconds you can create your own Tornado. You can create your own effects by adding food coloring to the water for wild colors. Give some sparkle to your Tornado by adding glitter to the water. For real clean fun, add a drop of dishwashing liquid. This is home to the original TORNADO TUBE®. The Tornado Tube® is manufactured in the US, and has been retooled to fit the newly designed American soda bottles. Please watch our blog for science experiments, specials and news on Tornados. Screw the bottles into opposite ends of the tube. Tip the bottle so that the full bottle is on top and give it a circular starting whirl. Presto! You have a vortex. Call it a tornado if you’re a meteorologist, or a whirlpool if you’re into oceanography. What is Happening Inside the Bottles? 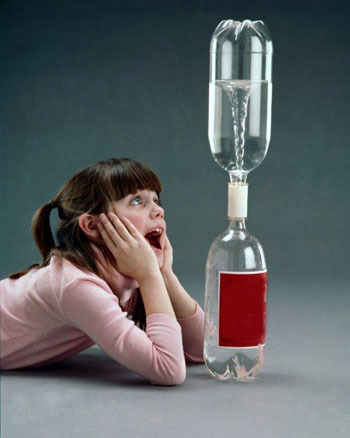 Your Tornado Tube provides a hands on demonstration of “VORTEX ACTION”. Tornados, whirlpools, waterspouts and similar motions in fluids that occur when liquid drops through an opening are called vortexes. The action is the concentration of kinetic energy (motion of the fluid). In the atmosphere, thermals and wind shear are the source of the energy which produces the vortex. In liquids, such as water, the potential energy (mass) is converted to kinetic energy as it descends, pulled by gravity through an opening. A small initial rotation about the opening becomes more violent (higher rotational velocity) as the molecules come closer to the center. The resulting outward force tends to keep the liquid out of the exact center, maintaining a “hole” in the remaining liquid. Looking to Purchase Tornado Tubes? TORNADO TUBES® can be purchased wholesale in poly bags, blister cards or bulk. The TORNADO TUBE® is shipped in boxes of 48, 96, 144 and 400. Display boxes are available on request. We now offer our “GLOW IN THE DARK” tube for a limited time only, at the same price as our other tubes. All packages contain directions on the back. Specialty orders can be arranged. Please call-in, fax or e-mail orders that vary from a standard box. Shipping is charged depending on your location.